Are you planning for a four days trip to Hyderabad, but you are unable to figure out how to plan the trip and what are the places to visit in Hyderabad city? Well, we are here to solve this confusion for you. We have given you a day wise plan so that you can enjoy your visit fully in Hyderabad. 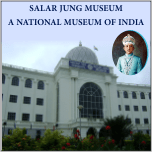 Start your day with Salarjung Museum. It is the largest one-man collections of antiques in the world. The museum houses over 43,000 paintings, 9,000 holographs and 47,000 books, 300 antique clocks, sculptures of stone, bronze idols, wood carvings, carvings of ivory and many more. The two things you cannot miss to see are the Veiled Rebecca and the British Bracket clock. The museum is closed on all Fridays. The entry fee is Rs. 10 for Indian nationals and Rs. 150 for foreign visitors. Photography is not allowed in the museum. On your way to Salarjung Museum from Afzalgunj, you can stop by to see these two buildings – Andhra Pradesh High Court and Government City College. The buildings are worth seeing. Must try dishes at this restaurant are Hyderabadi biryani, Kebabs, Haleem, Nahari, Pathar-ka-Gosht and Double-ka-Meetha. You will get a great meal at a reasonable price. On your visit to Hyderabad the one place that you should not miss is Charminar. Charminar is a square monument made of granite, limestone, mortar and pulverized marble. Each of the corners has a tall minaret. Inside the minerate, there are 149 winding steps to reach the top floor from where visitors can have a fascinating panorama of the old city. The visiting time is from 9 am to 5 pm. Entry fee is Rs. 5 for Indian nationals and Rs. 100 for foreign visitors. Photography fee is Rs. 25. Mecca Masjid is one of the oldest and largest mosques in India. It can accommodate ten thousand worshippers at a time. The mosque was built in the period of Mohammed Quli Qutub Shah and Aurangzeb. Visiting hours, from 8 am to 12 pm and from 3 pm to 8 pm. Chowmahalla palace was built in neo-classical style. This is the place where the Nizam met important officials. Today, it serves as an exclusive party venue, hosting corporate parties and social events. Visiting hours, from 10:30 am to 5 pm. Entry fee is Rs. 25 for Indian nationals and Rs. 150 for foreign visitors. Photography fee is Rs. 100. The palace will be closed on all Fridays. Now it’s time for shopping. Places to shop are Laad Baazar, Madina and Pathar Gatti where you will get to see beautiful lac bangles, handloom sarees, anarkali dresses, patiala, sherwani, ornaments studded with pearls, imitation jewellery and many more. For dinner visit Shah Ghouse Restaurant that serves a wide range of cuisine from mughlai to Chinese and not to forget the authentic Hyderabadi biryani. Dining: Kamat Hotel, Eat Street and Ohri’s 70mm. Begin day 2 with breakfast at Kamat Hotel. Get to taste breakfast items like idli, vada, dosa, uttapam, puri, paratha, upma, etc. They serve breakfast all day long. Birla Mandir is a Hindu temple built entirely with white marble. It is a combined architectural effort of Orissan and South Indian temples style. The temple has a 11 ft. granite idol of Lord Venkateshwara. Temple timings are from 7 am to 12 pm and from 3 pm to 9 pm. It is open all days of the week. The planetarium houses the unique Dinosaurium. It houses the 160 million years old fossil of the ‘Kotasaurus Yamanpalliensis’. The planetarium also has a science centre, museum and art gallery. The planetarium conducts sky shows in Telugu and English. Planetarium timings are from 11:30 am to 8 pm. The planetarium remains closed on the last Thursday of every month. Entry fee is Rs. 50. The museum was built in the year 1928 by Nizam Mir Osman Ali Khan. The museum has a collection of of rare arts and antiquities, stone sculptures, bronze works, manuscripts, modern paintings, textiles, coins of the Satavahana and Roman period and an Egyptian mummy. The museum is open between 10 am to 5 pm and is closed on Fridays. 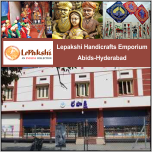 Lepakshi has a wide range of handicrafts including Kondapally toys, hand-paintings, Bidri ware, tribal embroidery, handloom products, jewellery, and many more. Just behind Lepakshi Handicrafts Emporium, don’t forget to visit the place Gunfoundry, a factory that manufactures cannon and cannonballs, it was set up in 17th century. You can also shop in Abids area, as there are many gold jewellery shops, textiles shop, footwear shops, and many other shops. Also check out some French and British missionary schools in and around Abids that became the root of Western education system in Hyderabad, back since 17th century – Little Flower High School, St. Paul’s High School, Rosary Convent, St. Joseph’s High School and All Saint’s School. Eat street is located around the Hussain Sagar lake. The ambiance of this place is chilled, relaxed and decent. You will find different variety of cuisine here: Subway, Pizzas and Burgers, Chinese, chaats, biryanis, etc. 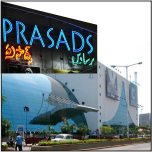 After lunch, you can get around Prasads Imax which is close by to Eat Street. It is a multiplex that houses five screens, food court, gaming zone and shopping mall that covers two levels of the complex. You can either watch a movie here or enjoy yourself in the gaming zone or shop around. Main features of this garden are, at the entrance there is a fountain, inside the garden there is a machan tree, car cafe, toy train, Japanese garden, fruit restaurant, family entertainment centre and more. The garden timing are 2.30 pm to 10 pm. It is open on all days. Entry fee for adults is Rs. 15 (age 12 years and above) and for children Rs .10 (age 3 years to 12 years). For camera the charges are Rs. 30 and for video camera the charges are Rs. 65. After seeing NTR Gardens, just opposite to it is Andhra Pradesh Secretariat, take a look. If time permits, drive your way to see the Dilkusha Guest House, next to Raj Bhavan road at Somajiguda. Visit Lumbini Park and experience the beautiful musical fountain, laser show and boating. The musical fountain has two shows at 7:15 pm and 8 pm. Entry fee to the park is Rs. 10. Now it’s time for dinner. Navigate your way to Ohri’s 70mm that has a theme of Bollywood. You will find posters of famous actors and actresses. You can either go for a buffet or order from the menu. On your way to Golconda Fort stop at Sarvi Restaurant at Mehdipatnam for breakfast. Golconda Fort was built under the Qutb Shahi dynasty. In those days it was a centre for diamond trade. One special feature of this fort is, a clap from the main gate can be heard at the highest point of the fort which is nearly 500 metres away. In the evenings there is a sound and light show that explains the history of the fort. The fort timings are 9 am to 5 pm. 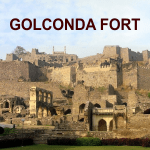 Golconda Fort is closed on Monday. Entry fee is Rs. 10 for Indian nationals and Rs. 100 for foreign visitors. Qutub Shahi Tombs is close to Golconda Fort. The tombs are influenced by Deccani structural ideas and are built in Hindu, Persian and Pathan architectural styles using grey granite, with stucco ornamentation. 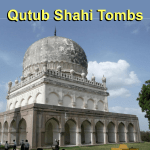 There are seven tombs and all the Qutub Shahi rulers are buries here, except Abdul Hassan Tana Shah who died in captivity. Timings are 9:30 am to 6:30 pm. It is closed on all Fridays. Entry fee is Rs. 20 for Indian nationals and Rs. 100 for foreign visitors. Enjoy the typical Hyderabadi street food on your visit to Golkonda and Qutub Shahi Tombs. You will find mirchi bhajis, egg bondas, samosas, onion pakoras, kababs, naan-ki-roti, fish fry, Biryani, etc., that are just lip-smacking. Today I want suggest you any sight seeing places in Hyderabad. Instead will go to Secunderabad, which is also known as Twin Cities. You can relax a bit and start your day around 10:30 am. Make your way to Secunderabad, and the first thing you need to check out is, Shradha Extension where you can shop for some gifts, greetings, decorative items, stationary and more. A little further Shradha Extension, there is Hare Rama Hare Krishna temple. It’s lunch time, head towards Paradise Food Court at Secunderabad if you are a non-veg lover try mutton or chicken biryani and khubani-ka-meetha, and if you are a vegetarian try eating at Utsav, purely vegetarian restaurant, it is at General Choudhri Road, Secunderabad. Just beside Utsav, there is Tivoli Cinema. After lunch if there is time left watch a matinee show (anywhere between 1:30 pm to 5:30 pm) at Tivoli Cinema, it is a good experience. After watching the movie, you can shop at General Bazaar, see some places like St. Ann’s High School, Keyes High School, Clock Tower, etc., and head towards Uppal. Drive through Osmania University campus, the campus is of nearly 1600 acres and it is home to nearly 300,000 students who are pursuing their higher studies. After seeing Osmania University campus make your way to Uppal. On the way you can see Habsiguda street no. 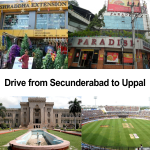 8, Genpact (BPO), Uppal Stadium and stop by Habsiguda X roads to eat some lip-smacking snacks, you will find many restaurants and food courts there. Now your day has come to an end, it’s time to get back to your hotel and relax. For dinner try out the local restaurant that is nearby to your hotel. If you are extending your stay at Hyderabad, you can visit places like Ramoji Film City, Nehru Zoological Park, shop at Monda Market, General Bazaar, Begum Bazaar, go to any of the malls – Inorbit, City Centre, Hyderabad Central or GVK. There are many places to visit in Hyderabad, a 4 day or 5 day travel plan doesn’t seem sufficient. But, we have tried to include all the places that you must visit in Hyderabad. Hope this information has helped you plan your 4 day trip to Hyderabad in a better way. This entry was posted on Feb 2014 at 6:46 PM	and is filed under Visiting Hyderabad. You can follow any responses to this entry through the RSS 2.0 feed. Your Feedback Matters!